Lauren Bon and the Optics Division of her Metabolic Studio have set up residence in the old Pittsburgh Plate Glass plant at the edge of the Owens Dry Lake, where they are reclaiming the chemicals and silver necessary to make and process photographic film and paper. 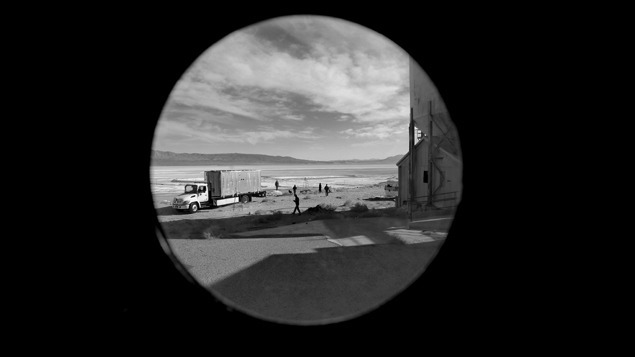 They then use the recaptured materials to make images of the lake in two camera obscuras, one built into a truck and another into one of the silos at the plant. Both are used to create panoramic images of the site. Paper negatives used are placed in large trays that are filled with water and left to evaporate over several months. This recreates the playa surface, allows for the silver to be re-recaptured—and creates the opportunity for making another print as a new iteration in the series. All of this activity is part of a larger social practice that Bon is exercising in the Owens Valley, the goal of which is to establish new local businesses in a depressed region based around water issues. The exhibition will be drawn from the extensive project archives collected by the Center for Art + Environment, and will feature the walk-in, Vietnam-era, portable U.S. Army darkroom used to process the harvested chemicals.